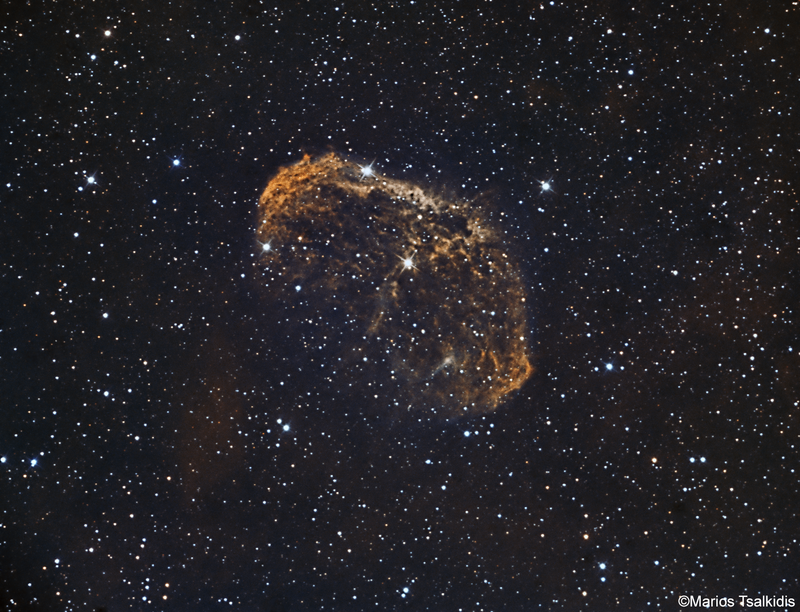 This is the Crescent nebula in narrowband. HA and OIII filters where used, but due to unstable tracking most of the frames did not make it into the stack which comprises barely from 8 frames of each channel. The target needs definitely more data which I will be gathering in the following days. 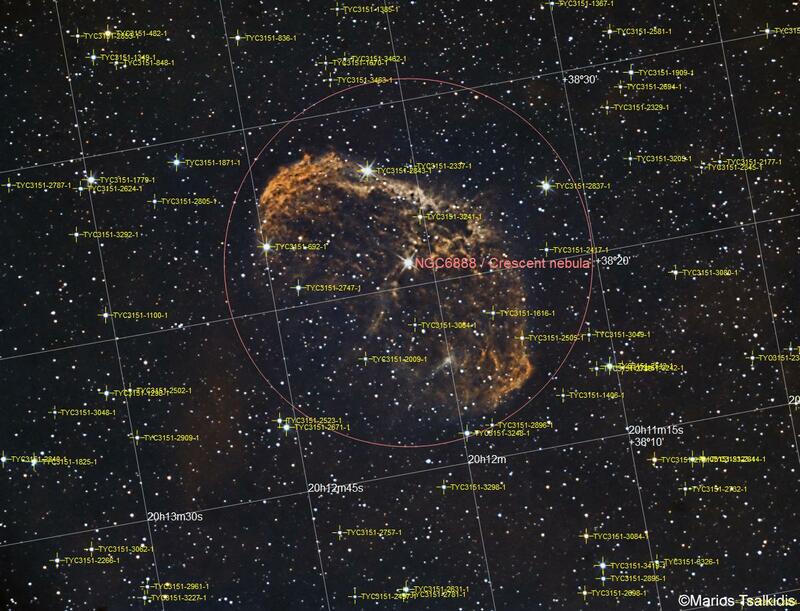 The Crescent Nebula is a beautiful emission nebula in the constellation Cygnus, about 5000 light-years away. Also known as NGC 6888, Caldwell 27, Sharpless 105. It is formed by the fast stellar wind from the Wolf-Rayet star WR 136 (HD 192163) colliding with and energizing the slower moving wind ejected by the star when it became a red giant around 230,000 to 400,000 (speculation) years ago. The result of the collision is a shell and two shock waves, one moving outward and one moving inward. The inward moving shock wave heats the stellar wind to X-ray-emitting temperatures. It is a rather faint object located about 2 degrees SW of Sadr. For most telescopes it requires a UHC (Ultra High Contrast) or OIII (Oxygen 3) filter to see. Under favourable circumstances a telescope as small as 8 cm aperture(with the use of appropriate filter) can see its nebulosity. Larger telescopes (20 cm of aperture or more) reveal the crescent or a Euro sign shape which makes some to call it the "Euro sign nebula". Filters used: Baader OIII 2" 8.5nm, Baader 7nm Ha 2"
Starlight Xpress Starlight Xpress FW 5*2"
Field of view ..... 43' 26.7" x 33' 11.9"